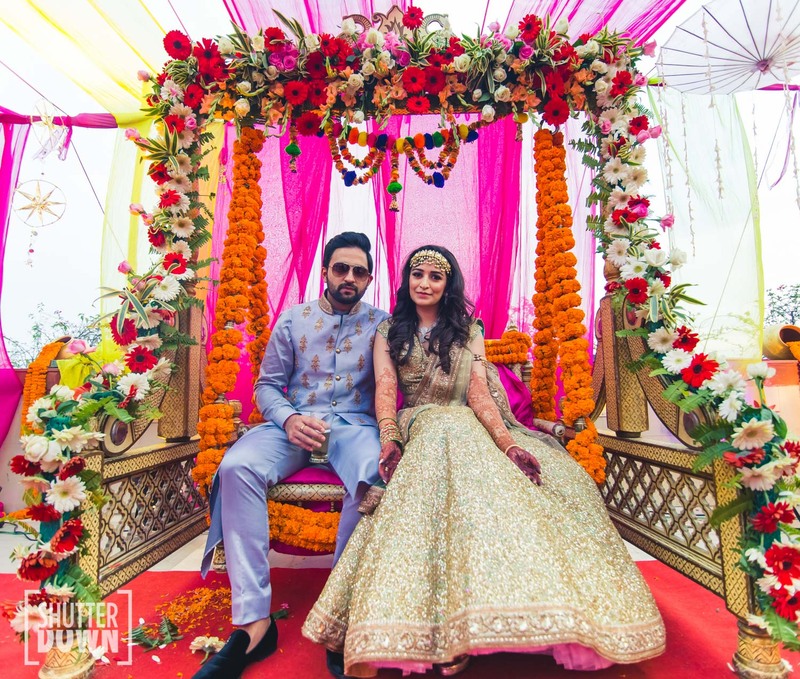 Bride Ambica got married to the love of her life Arjun and their wedding pictures by Shutterdown.in are all things amazing! 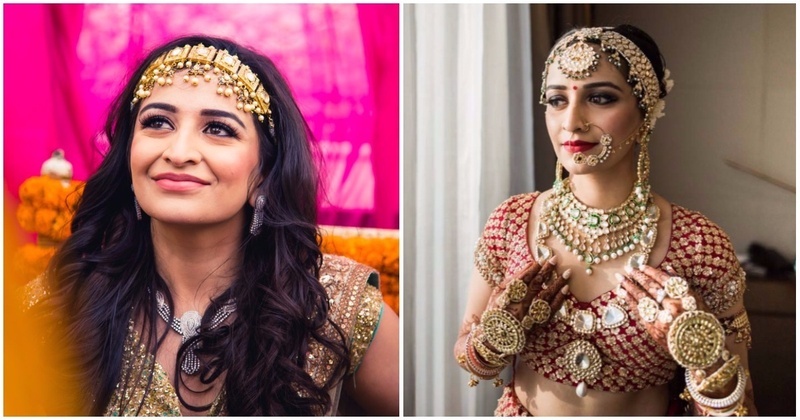 While each and every detail was fabulous in themselves, what we simply loved was her choice of bridal jewellery - for all her wedding functions. For her mehndi function, Ambica wore all gold. A glittering gold lehenga paired with matching jewellery. What we really loved was her incredibly unique matha-patti! She kept all other jewellery light, emphasizing on a statement gold mathapatti. Her haldi look was simple - as are most haldi looks. Ambica sure loves statement jewellery as she paired her ensemble with a pair of large, eye-catching earrings that matched her outfit. The sangeet night had Ambica looking stunning a pale pink lehenga. Once again, what caught our eyes is her jewellery! A large paasa and statement earrings completed her look. Do notice her unique diamond ring! For the wedding, our gorgeous bride didn’t hold back at all! She wore a red and gold lehenga, and went all out with her bridal jewellery. A choker-style polki neckpiece was paired with another long, heavy polki necklace. She wore matching earrings with both, a maang-tikka and matha-patti, completing her look with a beautiful nath. Oh and let’s not forget about her golden haath-phool which were also large and all about making a statement. Normally, we’d say this is going overboard with jewellery, but somehow this bride managed to pull it off beautifully!